The world is our classroom. Today we had our regular piano lesson in Canfield. 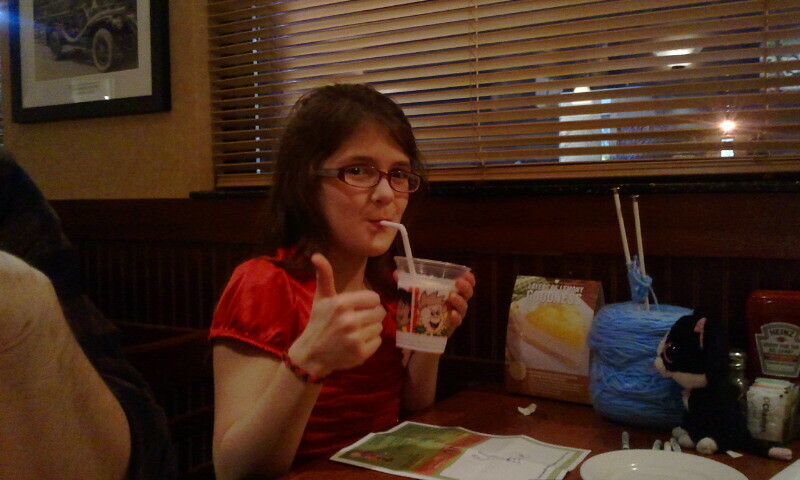 S9 ran through the piece she will perform later tonight at her YSU recital (Pyramid Power) on Neyla’s big piano. She also learned about the pentatonic scale and practiced counting beats out loud. Nelya asked us to order the Bastien “Major Key Signatures” for additional music theory. 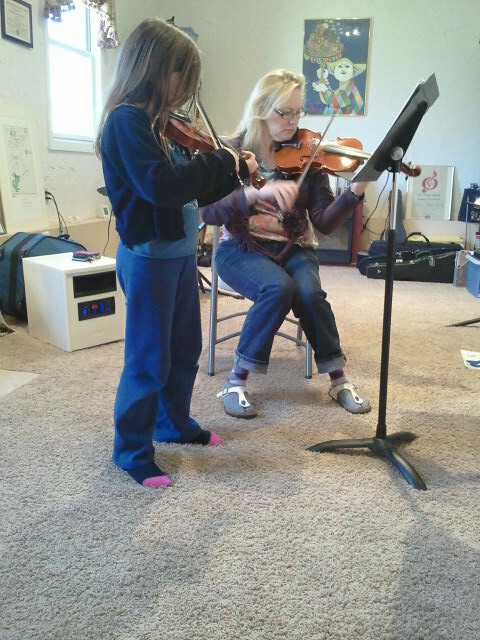 After piano, O8 had her regular violin lesson with Miss Tina. Next, O8 had a swim lesson with Ms. Barb. 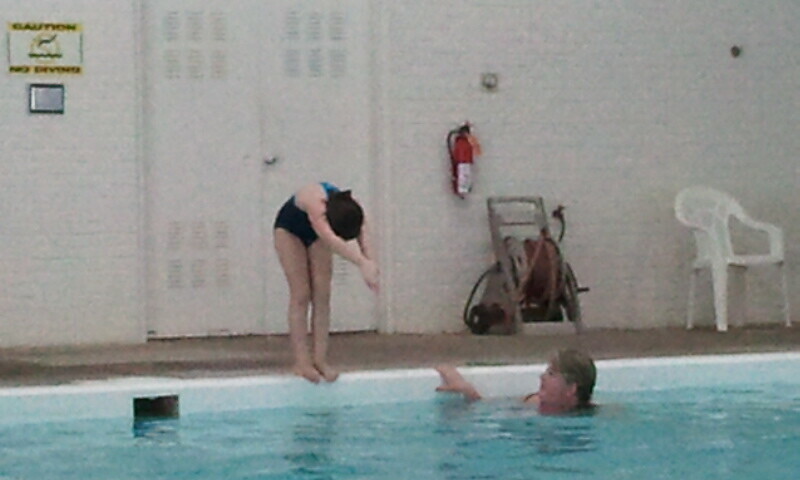 In addition to laps, she worked on diving. In the evening, S9 performed her piece at Bliss Hall. It was a rather imposing venue, but she played perfectly. She does not seem fazed a bit by the spotlight. Today O8 had her violin lesson with Miss Tina. She worked on Happy Farmer in Suzuki Book 2 and also started Bourrée. Miss Tina decided to start this before Waltz as she thought it might be less frustrating for our little violinist. Later in the day, S10 had soccer practice. She had to run an extra lap around the field because she had a hand ball during last Saturday’s game. Oops! Today we had our regular music lessons in Canfield. O8 and Miss Tina played Chorus together as a duet. At piano, S10 worked on her regular books and then I took my turn, working on scales and the Mozart Fantasy piece. At violin, O8 worked on her new Book 2 pieces: the Chorus, which she started on a few weeks ago, and a new piece: Musette. Miss Tina also showed her how she could play some of the music from Frozen. S10 received the sheet music for her birthday and it is, apparently, not difficult to play it on violin. Also apparently: we are not the first students to express an interest in learning the music. Miss Tina had a copy of the piano music in the studio because another student is also working on it. At piano, S10 showed Miss Nelya her Frozen book and they worked a bit on Let It Go. Then they worked on her regular repertory and technique books. In my lesson, I played the B major scales, 2-octave scale, & arpeggios; then we worked on the Beethoven Variations piece. I am polishing the theme and first two variations, which are technical, and working on bringing out the voices in the third variation. We next worked on the Mozart Fantasy. The allegretto section is still giving me some trouble. I also need to work on rhythm throughout. We discussed hosting a private recital for me and the girls, plus their friend A, sometime this spring at our house. Nelya is on board, so I just need to talk with Tina and A’s mother to see if they would be interested. 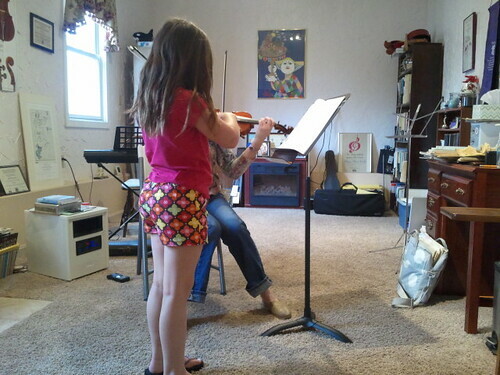 At her violin lesson, O8 worked on the Chorus in Book 2 and also on Gavotte from Book 1. At piano, S9 worked on her theory and technique books. She also worked on a performance piece. We are thinking of having a small recital sometime this spring so she can perform it. I worked on B major scales/arpeggios and also the Beethoven Variations and Mozart Fantasy. This week, because of spring break, we had violin on Monday instead of Tuesday. Piano is on hiatus this week while Ms. Nelya is on vacation with her family. In the afternoon, the nephews came over and went with us to take S9 to the last of her drawing classes. She worked on adding color to the sketch she did last week. While she was at class, we went over to the main library to explore. The kids found a lot of cool nooks and kid-friendly spots in the stacks. D10 was disappointed in the lack of Warriors books, but managed to find some other things of interest. We explored the upper floors, the kids’ area, the bathrooms, and then checked out a few books apiece to read while we waited for S9. Today we attended our regular music lessons in Canfield. 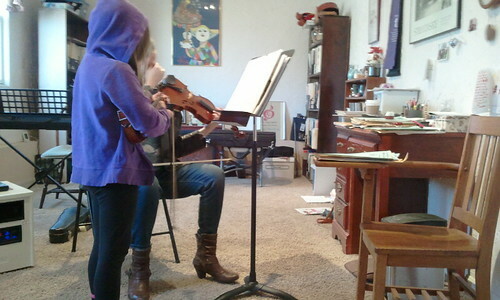 O8 went to her violin lesson first. We got to see her actual theory exam (she was one just a few of Tina’s students to get an actual 100%!) and also the two judges’ comments on her solo performance. They both complimented her sound quality and intonation. Then she started Gavotte, which is the last piece in Book 1. Next, we went to Nelya’s for piano. S9 went first, and we got to see her theory exam and solo comments, too. 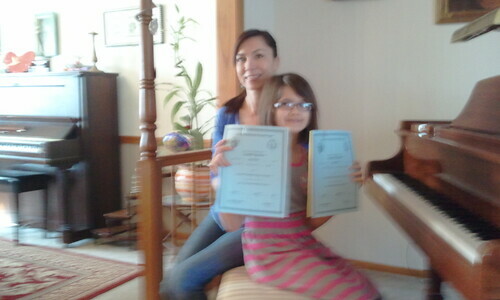 She made a small error on the theory test, but still qualified for a Superior rating. The judges liked her “showmanship and stage presence” in the solo. Big surprise there. 😉 She also earned a Unanimous Superior for her solo! Nelya asked if Sam wanted to play in the next Butler recital, which is coming up in April. She said she did, and they decided to work on a new piece, “Variations”, for her to play. 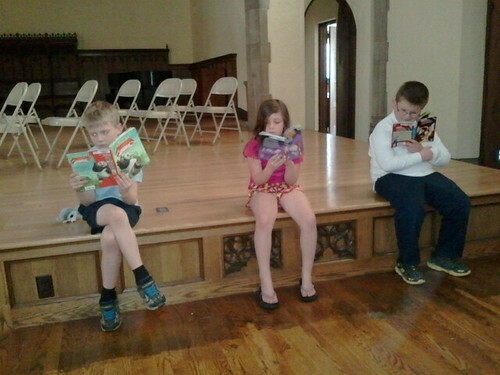 She is completely finished with the Red (Level 1) series and started in earnest on the Blue (Level 2) books today. I went next. We finished the E Major scales, arpeggios and dominant sevenths; now we are on to C# minor. Yikes. There are 4 sharps in this key. I’ve never played in C# minor before. It’s going to be challenging. For today, I prepared Variation 2 the Beethoven piece I have been working on : Six Variations on the Duet “Nel cor più non mi sento” from La Molinara by Paisiello. (a.k.a. “Variations”.) I also worked on the Mozart Fantasy in D minor. For next week: slow metronome work on the Fantasy, work on the C# minor and harmonic scales, and some compressions and rhythm exercises in Variation 1 of the Beethoven piece. I also ordered O8’s Suzuki Book 2 so we could start listening to the CD, the piano accompaniment book to go with it, and a copy of the Dover version of Mozart’s Sonatas and Fantasies (as I wanted an urtext version for the D minor piece). We sound like music geeks. Cool.